PLEASE NOTE: NIQUITIN MINT GUM HAS NOW BECOME NIQUITIN FRESHMINT GUM. The nicotine in cigarettes makes them addictive, but other substances in cigarette smoke, such as tar, carbon dioxide and other toxins, are more harmful to your health. NRT products like NiQuitin Mint Gum do not have the health dangers of tobacco. The nicotine from NRT reduces your cravings for cigarettes and helps you resist the urge to smoke. It also relieves some of the unpleasant symptoms (like feeling ill or irritable) that smokers have when they try to give up. stop smoking straightaway (a quit attempt). cut down on smoking, perhaps before you go on to stop completely (reducing to quit or just reducing). do not wish to smoke or are unable to smoke, for example in confined spaces (in the car; in the house), where others (such as children) could be harmed by tobacco smoke or in places where smoking is prohibited (temporary abstinence). develop cravings once you have stopped smoking. 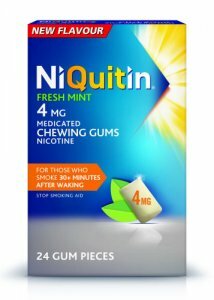 NiQuitin 4 mg Freshmint Gum is for smokers who smoke within 30 minutes of waking. 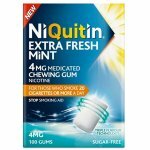 NiQuitin 2 mg Freshmint Gum is for smokers who smoke more than 30 minutes after waking. cutting down on smoking before you stop. cutting down with no immediate plans to stop. going without cigarettes for a short time. You should put a piece of gum in your mouth and periodically chew it, as described in the instructions below, for about 30 minutes. Dispose of it carefully. NiQuitin Mint Gum is not suitable for children under 12 years of age or for non-smokers. They may develop signs of nicotine overdose, including headache, sickness, stomach pain and diarrhoea. It is important to make every effort to stop smoking completely. But if you do sometimes smoke a cigarette while using NRT, don't be discouraged -just keep going with your quit attempt. It may help to talk to a healthcare professional if you are finding your quit attempt difficult. Use 8 -12 pieces of gum a day. Take a piece of gum whenever you have an urge to smoke. Use the gum like this for up to 3 months in total, then gradually reduce the number of pieces you use a day. Once you are using only 1-2 pieces of gum a day, try to stop using it altogether. If you started using the 4 mg gum, you can change to the 2 mg gum during the reduction stage. You may find it easier to quit completely later if you use NiQuitin Mint Gum to help you cut down. When you feel an urge to smoke, chew a piece of gum instead of having a cigarette to help you manage your cravings. Cut down the number of cigarettes you smoke per day by as many as possible. If you have not been able to cut down the number of cigarettes you smoke each day after 6 weeks, talk to a healthcare professional. If you have not felt able to make a quit attempt within 6 months of starting to use NRT, you may find it helpful to talk to a healthcare professional. When you feel an urge to smoke, chew a piece of gum instead of having a cigarette to help you manage your cravings. Cut down the number of cigarettes you smoke per day by as many as possible. It is best to stop smoking completely as soon as you feel able to. Going is chewed continuously, the nicotine is released too quickly and swallowed. This may irritate your throat, upset your stomach and give you hiccups. Chew a piece of gum when you feel the urge to smoke. Chew slowly until the taste becomes strong (about 1 minute) then stop and rest the gum against your cheek. When the taste fades chew a few times until the taste gets strong then rest the gum again. When the gum has lost its strong taste you should dispose of it carefully. The active substance is nicotine. Each piece of gum contains 2 mg or 4 mg (in the form of a resin complex called nicotine polacrilex). The other ingredients are chewing gum base. calcium carbonate, butylhydroxytoluene (E 321) as an antioxidant, sorbitol (E 420), maltitolliquid, glycerol, acesulfame potassium, flavour. mannitol (E 421), sodium carbonate anhydrous, sodium hydrogen carbonate and caroauba wax. NiQuitin 4 mg Mint Gum also contains colour quinoline yellow (E 104). 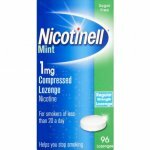 if you have stomach or duodenal ulcers or inflammation of the oesophagus or gullet (the passage between the mouth and stomach) because swallowing nicotine can make your symptoms worse. It may also cause mouth ulcers. If your symptoms do get worse you should talk to your doctor. You might want to use a non-oral form of NRT instead, such as patches. if you have been told by your doctor that you have an intolerance to some sugars, contact your doctor before taking this product. NiQuitin Mint Gum contains sorbitol (E 420). if you have had al/ergic reactions that involve swelling of the lips, face and throat (angioedema) or itchy skin rash (urticaria). Using NRT can sometimes trigger this type of reaction. if you are on a low sodium diet. Each piece of gum contains 11.4 mg sodium and the maximum daily dose (15 pieces of gum) contains 171 mg sodium. The maximum daily dose may be harmful if you are on a low sodium diet. NiQuitin Mint Gum contains butylhydroxytoluene (E 321) which may cause irritation to the mouth or the skin around it. NiQuitin Mint Gum is sugar-free. If you wear dentures (false teeth) that are poorly fitting or not clean you may have difficulty chewing the gum. Another NRT product may be more suitable for you, such as patch or lozenge. Smoking when you are pregnant is harmful to the baby. The risks include poor growth before birth, damage to the baby's lungs. premature birth and stillbirth. Stopping smoking is the best way to improve your health and the health of your baby, and the earlier you stop smoking the better. Aim if possible to use NRT for only 2 to 3 months. But remember -the most important thing is not to smoke. It is safer to carry on using NRT than to start smoking again. If you can use them, NRT gum or lozenges are better than patches. That's because you will not be absorbing nicotine into your body all the time. But if you feel sick.. you may need to use NRT patches instead. if you have ever had an allergic reaction to nicotine or any of the other ingredients. if you are under 12 years. The level of nicotine in NRT is not suitable for children under 12. Children are more susceptible to the effects of nicotine, and it could cause severe toxicity, which can be fatal. if you are in hospital because you have had a heart attack. severe heart rhythm disturbances or a stroke. Try to quit smoking without NRT unless your doctor has told you to use it. Once you are discharged from hospital, you can use NRT as normal. if you have serious liver or kidney problems because you may be more likely to get side effects. if you have uncontrolled overactive thyroid gland or an adrenal gland tumour (phaeochromocytoma) because nicotine may make your symptoms worse. If a child has used or eaten any of the gum, contact your doctor or hospital emergency department immediately. If possible, show them the NiQuitin Mint Gum packet or this leaflet. Symptoms of nicotine overdose in children include headache, sickness, stomach pain and diarrhoea. If you take too much gum, you may start to feel sick, dizzy and unwell. Stop using the gum and contact your doctor or hospital emergency department immediately. Like all medicines, the nicotine in NRT products can have side-effects. They are similar to those you might get from the nicotine in cigarettes, and are more likely the more nicotine you take, but not everybody gets them. At the recommended doses NiQuitin Mint Gum has not been found to cause any serious side-effects. Stopping smoking itself can cause some symptoms such as dizziness, headache, sleep disturbance and more mouth ulcers than usual. Troublesome side-effects that do not improve. Stop taking the gum and tell a healthcare professional if you get these. Allergic reactions e.g. swelling, a rapid irregular heartbeat or palpitations (feeling your heart beat). Sore/irritated throat, more saliva than usual, hiccups. Feeling sick, stomach pains, jaw ache. If you wear dentures it is possible that the gum may stick to them or, in rare cases, damage them. If you do get any side-effects, even those not mentioned in this leaflet, tell a healthcare professional. Do not use this medicine after the 'EXP' date shown on the blister pack and outer packaging. The expiry date refers to the last day of the month. Keep all pieces of gum in the carton, in their blister pack, until you are ready to use one. Do not store above 25·C. where your second-hand smoke may damage other people, such as children. where smoking is not allowed, such as on a flight or in a hospital. when smoking should be avoided. such as before surgery. When you feel an urge to smoke. chew a piece of gum instead of having a cigarette to help you manage your cravings. Continue to use one piece of gum every 1-2 hourt (maximum 15 a day) during the period when you are avoiding smoking. After you have stopped smoking, you may still sometimes feel a craving for a cigarette. 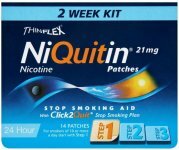 You can use NiQuitin Mint Gum again to help you relieve these cravings -using NRT is always better than smoking again. If you are worried that you may start smoking again. talk to a healthcare professional. They can advise you on how to get the best results from further courses of NRT. The method of chewing nicotine gum is not the same as for ordinary chewing gum. The gum is chewed to release nicotine then rested. so that nicotine can be taken into your to protect the environment.